Joel Feder February 2, 2018 Comment Now! Subaru’s STI division has a recipe for more fun. Add liberal amounts of better handling, a dash more power, then bring the heat. In the case of the $50,000 2018 Subaru WRX STI Type RA, the recipe is fully baked. After spending a day with this special edition model—limited to only 500 units in the U.S.—it’s clear that it’s a better handling, faster, WRX STI that owns a space in the market nothing else floats in. Walk up to the WRX STI Type RA and its looks are special. From the gold BBS wheels to the massive carbon fiber wing and roof panel, its dressing is beyond an ordinary WRX STI. But it’s not overdressed. It’s still just as easy to live with, despite the aggressively bolstered seats and short-throw shifter. At its base it’s a Subaru sedan, after all. Visibility is terrific and that rear wing disappears in the rear window thanks to its profile. Driving around town, the lower-restriction exhaust setup reveals itself at around 1,500 rpm. It’s annoying, and revs are better kept just above that level to avoid the noise. The baked California city streets stop and the STI WRX Type RA points its nose up into the canyons of Palm Springs, California heading to the Thermal Club racetrack. With just 68 pounds cut from the WRX STI, the Type RA’s claim of better handling tests my hibernating brain fresh from Minnesota’s snowy climes. Once on the track at Thermal Club it’s clear it wasn’t my imagination, the WRX STI Type RA is easier to steer. It’s more willing and ready to comply with steering commands thanks to the autoclave carbon fiber roof, which gives it better steering response, along with the updated damping force rates. Pro rally driver Mark Higgins provided sideways hot laps around Thermal’s racetrack, and confirmed my suspicions in Turn 2. “This is just far easier to drive fast around the racetrack (than the WRX STI). It fights you less and responds to steering input far easier,” he said. Expert testimony. 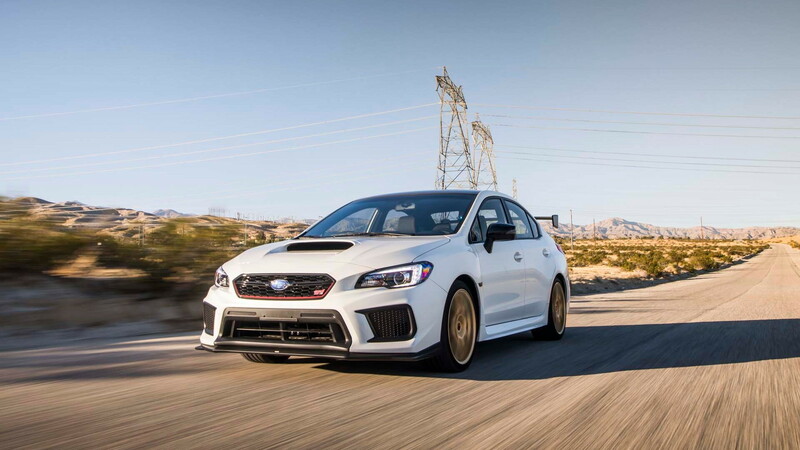 Better steering doesn’t just mean it’s easier to drive the WRX STI Type RA fast, it means it’s actually faster than the WRX STI too. Brother David Higgins lapped Virginia International Raceway 4.37 seconds quicker in the WRX STI Type RA than in the stock 2018 WRX STI. That’s a lifetime on a stopwatch. The classic gold BBS wheels have returned on the Type RA, but with more purpose this time. The aluminum forged wheels help shave 17.2 pounds of rotating mass. 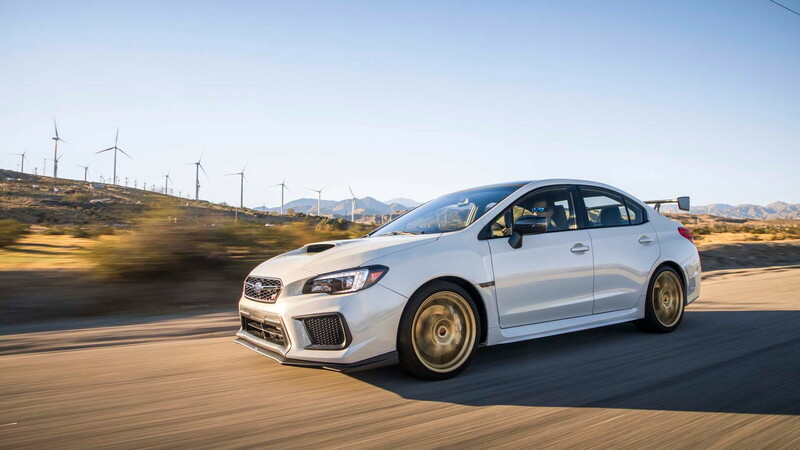 Furthering mass reduction is a carbon fiber roof panel (made from autoclave carbon fiber, a special carbon fiber found in aerospace applications) that saves 8 pounds over the standard WRX STI while increasing body stiffness. Bilstein dampers (History: The Legacy SpecB is the only other Subaru in the U.S. to use Bilstein dampers) have higher damper force at lower piston speeds than a standard WRX STI, and are a mono-tube setup with large diameter piston for improved damping force response. Fans of “The Fast and the Furious” will be drawn to the massive carbon fiber wing mounted to the rear trunk lid, which saves 6.83 pounds over the standard STI’s rear wing while providing more downforce to the tune of up to 116 percent (64 percent more downforce when in the flat position). 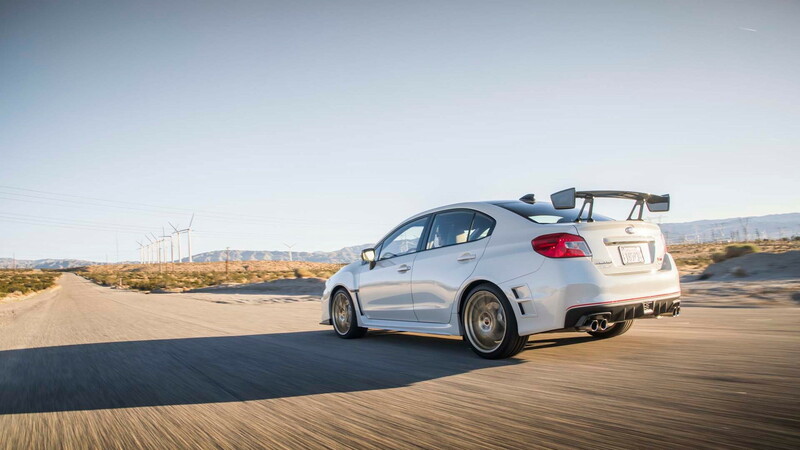 A front underspoiler adds grip thanks to 21.8 percent more downforce than the standard WRX STI, and the rear bumper vent reduces drag and lift by 0.5 percent. End result? The Type RA sticks like raw honey and is just as sweet on the track. 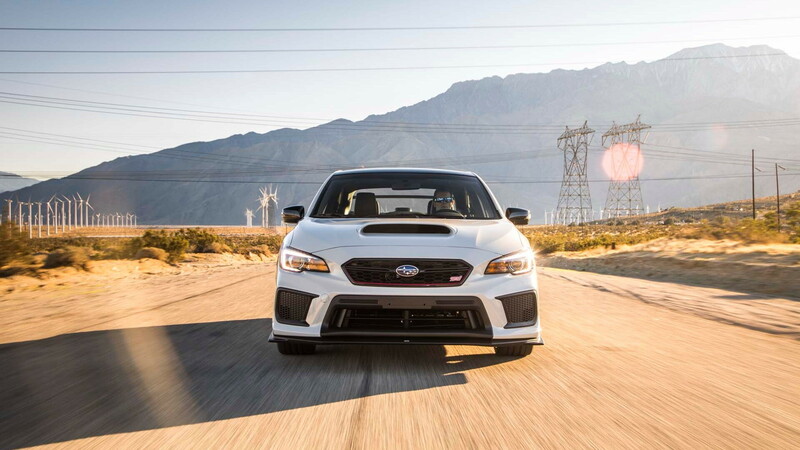 A revised intake and ECU setup along with larger diameter exhaust setup nets the Type RA 5 horsepower over the standard WRX STI for a total of 310 horsepower. 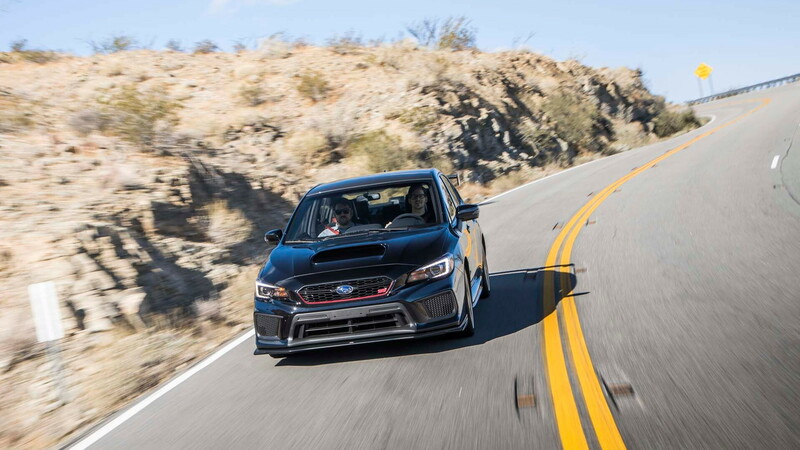 While the shifter is a shorter throw than the standard WRX STI, it connects to a transmission that has a lower third-gear ratio in the Type RA which makes it 5 percent quicker from 50 to 70 mph according to Subaru. For $50,000 the WRX STI Type RA is playing with no direct competition. You could buy a Chevrolet Camaro SS 1LE with thundering V-8 engine, but it’s a coupe with poor visibility. There’s the Mercedes-AMG CLA45, but it’s slightly more expensive, and that’s before a single option is added. This is a white space that the WRX STI Type RA is about to play in. Priced from $48,995 with no option packages, the 2018 WRX STI Type RA is expensive. It’s also going to be rare with only 500 being built, and that inherently makes it special. Want one? Here are a few winning arguments. Feel free to tell your significant other it’s a serialized special edition and you simply have to have it. If nothing else, tell them you’re saving a bundle by not buying a well-optioned Mercedes-AMG CLA45. Subaru provided travel and lodging to Internet Brands Automotive to bring you this firsthand report.